Here's a screenshot of the puzzler window....enjoy! Render by janimatrix. Copyright 2005. All rights reserved. Puzzle by geoegress. copyright 2005. Render was created by jan chalmers in Bryce5. Unzip like normal. Double-click the .exe file to start it up. It runs from the folder it's in, doesn't need installation anywhere special. This file may be freely shared for noncommercial use. "If you wish- put it in free stuff here [rendervisions] and at renderosity. It is TOTALLY yours to do with as you wish. Totally! I was thinking of starting a service for us artists to make these for 5 dollars per. Because I bought the Pro version I have the right to give em away or sell them. And all the other licenses don't grant that option plus they have advert links all over em that you can't change. Only the pay version like I have lets you pick and choose." 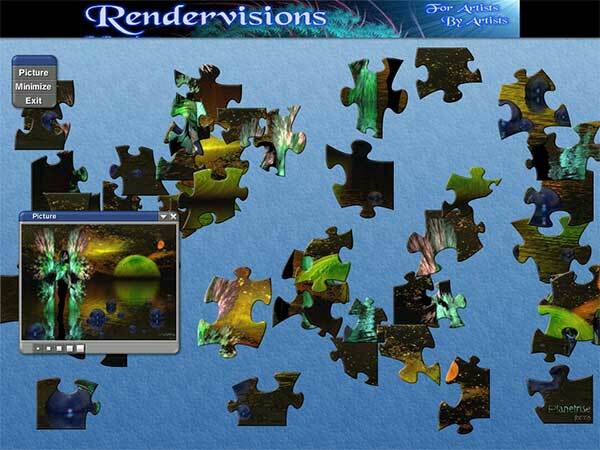 Contact Geo for info on making your renders into puzzlers! ..and my many thanks to him for choosing one of mine to play with! "Although we are all in the gutter- some of us look up to see the stars."